Every day my colleagues and I need to perform several printing tasks. We have to print documentation related to office activities and also print newly created technical drawings on a plotter. I would rather our company be able to spend more time on important activities and less time on printing. Is there a way I can automate these routine printing tasks? Your office has stumbled upon a common problem we see in today’s business environment: spending too much time on mundane and routine tasks. fCoder is ready to give you more time to focus on the most important tasks on your plate by automating your print activities. Through the use of one of our innovative software products, FolderMill, you can automate any and all of your printing activities. You and your colleagues won’t have to worry about printing any document when you incorporate FolderMill into your workflow. Once installed on one of your servers FolderMill allows you to establish folders to carry out all the print tasks in your job jar. These folders can be thought of as "watch folders" because they "watch" for documents to be placed in the folder and will then carry out whatever tasks assigned. For instance, your office has to print out documentation every day and must also send new technical drawings to a plotter. FolderMill will automate this task for you and you won’t have to worry about printing anymore. You can create a specific folder to be monitored by FolderMill that will print your everyday office documents. You and your co-workers just place one of your documents into that folder and the software will print the document. There are other options available as well. If you want some documents in color or printed on both sides, all you need to do is create folders for those tasks. As with the other "watch folders", once someone places a document into one of these folders the software will automatically print the document the correct way. Automating these print tasks is also possible for the technical drawings you need to send to a plotter. Create a "watch folder" for the drawings and configure the folder to print to your plotter. Now, when you place a new technical drawing into the folder the program will immediately send the document to the plotter. 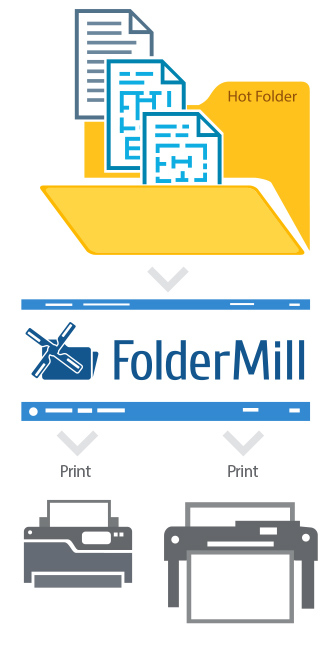 By using FolderMill and its associated "watch folders" you’ve now automated all your routine printing tasks. Plus, you have eliminated the possibility of print errors or mistakes. Once the "watch folders" are configured there’s no chance of printing something incorrectly. The software takes away the risk of wasting paper, toner and money by printing all documents the right way every time. Now that you’ve automated your print tasks with FolderMill and its "watch folders" you can spend more time focused on the important tasks ahead of you. The software will take care of the routine print tasks and leaves you with one less thing to worry about.